"But fate had other plans for us. The war turned our Studio into a military reservation. All facilities were devoted to making films for the war effort...insignia for submarines, planes, ships, and tanks...training films for the Army, Navy, and Air Force." Walt Disney. 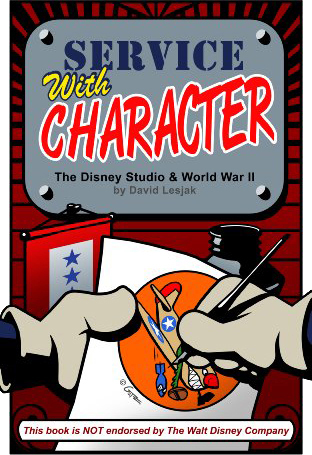 World War II had a profound impact on Walt Disney and his Studio. The onset of the war couldn't have come at a worse time for the Hollywood producer. The Studio was coming off a highpoint in its history. Revenue from Snow White enabled Disney to build his new, ultra-modern Studio in Burbank, and feature production was in full swing. Just as a string of new Disney features were about to open, the Nazi juggernaut rolled across most of Europe shuttering theater doors in the process. Prewar, Disney films were distributed to 55 countries. By 1944, 81% of the Company’s revenue was being generated by just the United States, Canada, and England. As the yoke of oppression descended on Europe, Walt Disney’s ledger flowed from black to red. Disney and his staff quickly adapted to the new reality by becoming a bonafide war plant. Feature film production was replaced, for the most part, with government and military work. Instead of classic fairy tales, Disney produced training films for all branches of the military, incentive films for the Federal Government, and a series of propaganda films the Studio’s own publicity Department referred to as “psychological productions.” The day after Pearl Harbor, Disney entered into a contract with the Navy for the production of a series of airplane identification films. Government worked sustained his Studio for the war's duration and Walt Disney, ever the patriot, offered his services at cost or for free. Disney characters also pitched-in on the home front. Mickey, Donald, Goofy, and the rest of the gang promoted war bonds, savings stamps, blood donor drives, gas and food rationing, victory gardens, and scrap and salvage campaigns. And as new fighting units were formed, Disney artists fulfilled 1,200 requests for combat insignia sent in not only by American servicemen looking for a familiar reminder of life back home, but also by men serving in the units of Allied nations like Britain, Canada, China, France, and Poland. Ten appendices, end notes, and over 385 images (340 in color) supplement the text. World War II changed the possibilities for animation. Prior to the war, animation was seen as a form of childish entertainment. The attack on Pearl Harbor was a turning point in its utility. On December 8, 1941, the US Army began working with Walt Disney at his studio, stationing Army personnel there for the duration of the war. The Army and Disney set about making various types of films for several different audiences. Most films meant for the public included some type of propaganda, while films for the troops included training and education about a given topic. Films intended for the public were often meant to build morale. They allowed Americans to release their anger and frustration through ridicule and crude humor. Many films simply reflected the war culture and were pure entertainment. Others carried strong messages meant to arouse public involvement or set a public mood. Animated cartoons allowed the government to spread their message in a much more entertaining manner, especially when it came to War Bond drives. 01 Jan 43: Disney releases "Der Fuehrer's Face"
20 May 44: Merrie Melodies releases "Russian Rhapsody"